The Inside Out Life: Feb 8 Sermon: "Conclusive Evidence that Jesus was an Introvert, and Other Things that Make the Pastor Feel Better About Himself"
Feb 8 Sermon: "Conclusive Evidence that Jesus was an Introvert, and Other Things that Make the Pastor Feel Better About Himself"
I haven’t seen a lot of literature about this, so I don’t have statistics to back it up, but it is my experience that one of the biggest barriers the church has in reaching out to new people is that coming to church for the first time can be terrifying, especially for introverts. Some estimates suggest that up to half of the population in the United States identifies as introverted, which is to say that they get energy from being alone and can become quickly overwhelmed in crowds. I’ve been reading a lot of stuff lately about welcoming new people to church, and the number one thing that apparently turns people off is the passing of the peace, the time when we stand and greet one another. Especially for people who are more introverted, this time can be terrifying, and when I am in unfamiliar church worship services, I have been known to spend the first two-thirds of the worship service dreading the passing of the peace. I know that sounds ridiculous, at least to the extraverts in the room, but it is true. In fact, you will notice that we took it out this week; we aren’t doing the passing of the peace. I still think it is important to do, I still want to do it occasionally, but I also think it is important to switch things around a bit and give the introverts, which is half of us, a little bit of a break. 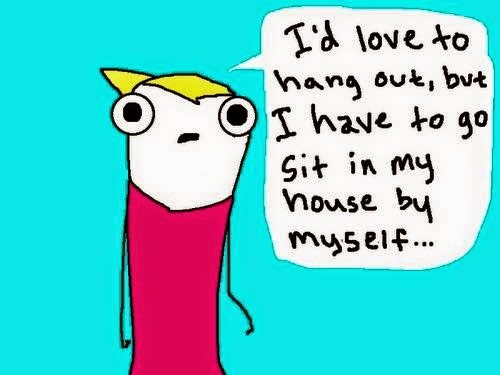 Just so we are clear: my name is Dalton and I am an introvert. I’ve mentioned this in the pulpit before, but I get my energy from being alone. Big crowds totally freak me out. If there is a Hell, it is going to look like a crowded room full of people, and it would be just my luck that I get there just in time for the passing of the peace. And so I am particularly grateful for this morning’s scripture lesson, in which Jesus goes off to the desert alone. He does this often, and in my mind, it is proof enough that Jesus was an introvert. As you will see in this morning’s sermon title, this fact certainly makes me feel better about myself, because it is the case that American culture privileges extraversion. The quiet kid is rarely the popular kid. The successful executive is the outgoing executive. And so to my fellow introverts, I say this: when the extraverts lay claim to the popular crowd and the successful crowd and the powerful crowd, you just remind them that they may have most of the powerful leaders in the world, but we have Jesus. Now, I know that in a lot of ways that’s not helpful. The last thing we need is another label to divide us, and even this one only helps to a certain extent. But I do think this story has something to teach us. There is something to be said for going off alone every once in a while. Notice I didn’t say there is something to be said for sitting in the corner hunched over your smartphone like Quasimodo. Maybe that’s a survival mechanism when you’re stuck in a room full of people, but it isn’t productive. It doesn’t do what going off alone can do. This story has something to teach us, because there’s something to be said for quiet, and if there is any currency that is especially rare, especially valuable these days, it is quiet. I mean, think about it. When is the last time you experienced real quiet, real stillness? When is the last time you found yourself in the wilderness, with no sounds but the birds overhead and the soft pad of your footsteps below? I wish I were exaggerating, but most days it feels like I can’t go twelve seconds without looking at my phone. The crazy thing is that I am somebody who craves silence! It is not like I am afraid of it—I crave it! If I don’t get enough time by myself, I get especially cranky, which come to think of it explains a lot! And yet even as someone who need to balance time with people with time alone, I seem to be terrible at making time to be alone and quiet. There’s always something to be done, somebody to visit, a room to clean, an email to send, an appointment to make, a meal to cook, a child to care for. I remember reading about something that President Nixon said back in the mid-50’s when he and President Eisenhower were running for reelection, saying that if the country would just reelect Eisenhower for another term, we’d see a 32-hour work week in the not-too-distant-future. We’d be people of leisure, and we’d have so much free time we’d have to search for things to do! And yet here we are in 2015, and your calendar probably looks like mine. Things on top of things on top of things. Work weeks that drag into family time. Personal responsibilities that bleed into the wee hours of the morning. Technology was supposed to male our lives easier, to give us a four day work week, and yet if I am honest, there are days I have a real temptation to roll down the window and throw my phone into the intersection of Church Street and North Decatur Road. I remember growing up with three younger siblings, and my mom would have one of those big desk calendars taped to the front of the refrigerator, and each of the four kids would be represented by a different color pen, so that she knew who to take to soccer practice and who to take to afterschool events and who to take to violin lessons. By the time she finished planning a month it would look like a pack of Crayola markers had thrown up on the calendar! And somehow now that all the kids are grown and out of the house, the calendar still looks that way. Just walking past that thing stresses me out. Now, my calendar is electronic, but it is just as full as the one on my parents’ refrigerator! We’re all busy people, and so in response to this dynamic, the church council of this church said, “let’s add one more thing to everybody’s plates!” and so we started looking into creating Life Groups. There are churches, many of them, who encourage their folks to gather in small groups, and those churches have found this kind of ministry to be fruitful, and besides, this is the original model of church anyway, small groups of people who gather together, who are accountable to one another, who share joys and concerns and life with one another, and then who come together with other people in other groups to worship God together, as one body. And so, they decided, we ought to divide the church up geographically into smaller Life Groups, which is what we have done, and encourage them to meet monthly, which is what we are doing. Our first meeting will be right after church on February 22, and we’ll be contacting folks about their groups over the next couple of weeks. If you haven’t received a letter about this let me know and I will be sure to get you more information. And if this feels like too much, like just one more thing, let us remember that the whole of Jesus’s public ministry was all crammed into all of three years, and somehow, with everything else he had to do, he somehow had enough time to go off on his own every now and again to pray. I don’t care how holy you are—if you constantly have people who need things from you, if you keep constantly busy, if you can never find time to slow down enough to examine your heart and listen for the voice of God—I don’t care how holy you are, you’re never going to get quiet enough to hear God’s call. Let me put it this way. If not even Jesus could sufficiently tend to his inner life without going away alone, you don’t stand a chance! I have to tell you, I’ve been in the church long enough to be able to tell when somebody is avoiding dealing with their own stuff, their own baggage. I can tell because those people are always busy, always doing something, and that’s not to say they are doing bad things! I am sure it sounds strange that sometimes I can tell when something is wrong when people serve too much, but I have met plenty of people who hide behind serving others, who hide behind always working, always helping, and I mean, I know God wants us to serve! But if we are interested in following Jesus, in being like Jesus, then let’s actually be like Jesus and find time to go off alone, to find time to be present with your thoughts, and yes, to let your demons raise their hands every once in a while, because if I know anything about the demons that plague us, those voices that tell us that we aren’t good enough, or that everybody else has it together, you can’t bury those demons in a pile of work and expect them to go away! You can’t stay so busy that they go away! But you can learn to live with them, to domesticate them in a way, so that when they try to get your attention, you can pat them on the head and tell them to heel! You simply can’t expect to be faithful without intentionally tending to your heart, and maybe this is a crazy thing for the pastor of a church launching a major Life Group initiative to say, but you can’t tend to your heart without being alone! This is what Jesus tells us. This is what he shows us. But then, you can’t spend all your time alone, either. You can’t spend all your time in your head, working out your own stuff, and somehow reach enlightenment or whatever. You can’t stay home by yourself all the time and be faithful. Left to my own devices, I’m liable to sit at home all the time, never see another soul, and yet the church pulls me out! I may be oriented to be introspective, maybe you are, too, but we shouldn’t stay introspective so that we can avoid other people any more than we should stay busy with other people to avoid our own thoughts. You must have balance. Balance. And so we look to scripture, and in this morning’s passage we find Jesus in a variety of settings. He starts in the synagogue, in the house of worship, with all the faithful in the town, and from there, he goes off with a small group, four of his trusted disciples, and heals Peter’s mother-in-law, because you need those close relationships, that support. And then he heads off to a large group of people in need of healing before he goes off by himself into the deserted place to pray. I find this to be such a helpful example of balance. Like Jesus in the synagogue, we need to be in worship together. And we need to do mission together, to go out into the larger world to serve. But so do we need to be in small groups together, so do we need to make sure to have time alone to pray, to read the Bible, to meditate on the presence of God in our lives. And listen, if you are new to this whole church thing, if you aren’t sure how to pray, just do this. Just find some time, set an alarm for two minutes—five minutes!—and be quiet. Then take some time and share the desires of your heart with God. Think them, say them out loud, write them down, whatever. Ask for forgiveness. Say amen, and congratulations, you have prayed. That’s all there is to it. And yet it is so very important. We need to be involved in all of these ways, in solitude, in small groups, in corporate worship, in mission out in the larger world. To put it another way, the life of faith looks like this: we start with ourselves and our own relationship with God and expand our influence, so I start with me, and then I expand to my small group, those relationships that keep me accountable and who love and care for me, and then I expand to my church community, the people I love and worship with, and then I expand beyond the doors of the church in mission to all the world, for the mission of the church isn’t just to have great worship, but to make disciples of Jesus Christ for the transformation of the world! Each of these pieces is important, and I’ll be honest, here at North Decatur United Methodist Church, we are pretty great at two of them. We’re pretty good at worship—the young folks who have led us this morning are proof of that. And we’re great at mission—wonderful at reaching out in love, wonderful at advocating that everyone has a place to sleep and a spot at God’s table. But we have room for improvement on the small group front, which is why we’re taking so much time to push these Life Groups. They are vital—vital!—parts of what it means to be a part of the family of God. It is so important to gather with people who live near you, who understand your neighborhood and who can provide care for you where you are, and who knows, maybe these groups become ways to welcome new people into the fold of this great congregation, as you look to a neighbor and say, hey, don’t bring a thing, but come eat with us. Come fellowship with us. We’re not all the same—we’re of all ages and races and we fall on a wide spectrum of belief—but we are united in our devotion to Jesus Christ. This is why a small group is so important. And, I think, many of us, many of us could use a little work on being quiet enough to share the desires and pains of our own hearts with God, taking time to slow down enough to hear the gentle drumming of your heart, so that the very rhythm that orders your life doesn’t get lost among the noise. I’ll just speak for myself here. The whole idea of this passage making me feel better about myself is a joke, of course, because while I am an introvert, I’m awful about sitting with my thoughts, awful about making time to be alone with God. It’s a joke, because I ought to be worrying less about finding ways that Jesus is like me and worrying more about finding ways that I can be more like Jesus. I doubt I’m alone, and so I think each of us would do well to take time to tend to our own personal relationships with Jesus, to listen for the whisper of the Holy Spirit, the call of God on your life that is like nobody else’s calling, because it is for you. The good news is this. Every time I make time for God in my life, every time I intentionally carve out time to gather with others and balance it with time to be alone, I find myself blessed. I find myself in the presence of God, more attuned to God’s hopes for my life and more at peace. And when I don’t make time, I’m miserable, and it seems that I get less done. I try to squeeze it in here and there, but the quote from Philip Stanhope is true: there is time enough for everything, in the course of the day, if you do but one thing at once; but there is not time enough in the year, if you will do two things at a time. The same is true for your faith. There’s enough time, if you will take time for it. But if you don’t, well . . . don’t be surprised if you find yourself standing at your calendar with a crowbar and some WD-40, trying to wedge in one more thing. I know that we’re busy people. I know that. Believe me, I get that suggesting we find time for this stuff—for small groups and for alone time—I know that it, too, may sound like one big joke as you consider the calendar that is your life. But I also know this. At the end of the day, the problem isn’t that we don’t have time to gather and time to be alone. The problem is that, this being the most important stuff in the whole world, we don’t have time not to.